Multi Rose 1 1/4"/3.2cm Tumbled,Versailles Pattern is a classic collection of travertine tiles that have been set in a Versailles pattern. These have wonderful variety of marbling or natural veining and come in a vibrant pinkish hue. It also features some texture and unevenness for that rustic or aged-appearance. 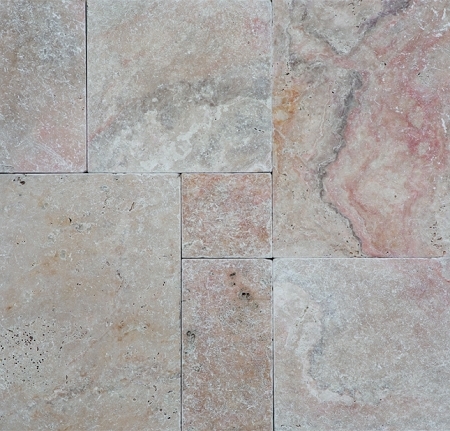 Multi Rose 1 1/4"/3.2cm Tumbled,Versailles Pattern is sought after for its affordable price and natural beauty. It is highly resilient and durable so expect it to be resistant to a lot of years’ wear. This is a preferred choice for designers as each piece possesses unique veining, so no two sets are completely alike. Multi Rose 1 1/4"/3.2cm Tumbled,Versailles Pattern is best used for outdoor applications such as landscaping for your garden or backyard. It is also practical to use as pathways, driveways and entrances due to its durability. It is very rustic and can be appealing as terrace flooring.